Maps are representations. Topographic maps are maps that reveal the surface of the earth from the tops of mountains to the depths of the oceans. The variance in elevation of the earth’s surface is shown by contour lines. 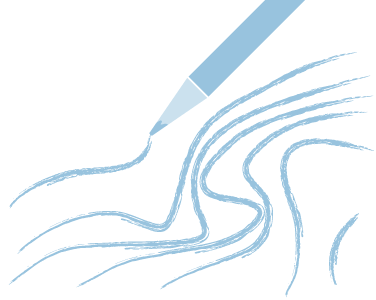 Contour lines are imaginary lines that are drawn connecting points of equal elevation. Usually contour lines represent height above or below mean sea level or 0. When contour lines are close together, it means that the land or earth’s surface is descending or ascending steeply. In contrast, when contour lines are far apart it means that the earth’s surface is relatively flat. Contour lines never cross. Each contour line represents a separate elevation. Different maps use different intervals between contour lines depending upon the scale of the map. Flat areas may use contours every ten feet while mountainous areas may strike a contour every one hundred feet. Colors on topographic maps are use to show such features as vegetation (green), water (blue) and built up areas (gray, beige or red). 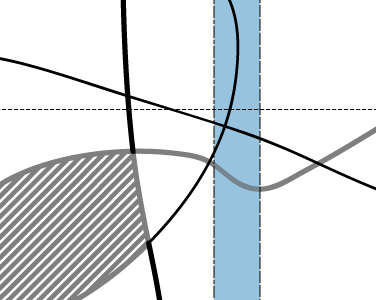 The lines connecting areas may be straight, curved, solid, dashed, dotted, or any combination. Some lines may also show railroad tracks, streams, and even state and county boundaries. 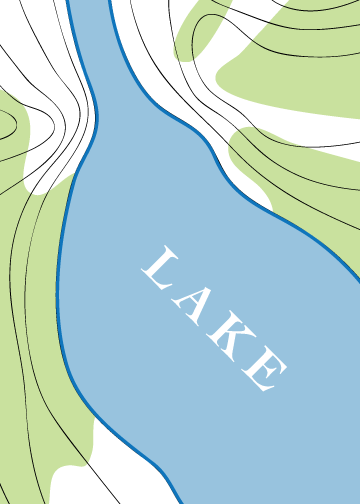 In addition to lines on topographic maps, there are many types of symbols. Symbols may locate significant buildings, historical sites, campgrounds, springs, wells, control points. Does the land rise or does it fall? Does it make mountains or does it have valleys. Is it flat or gently sloping? Take a look at the ARC GIS USA Topographic Map to learn about the lay of the land where you live. 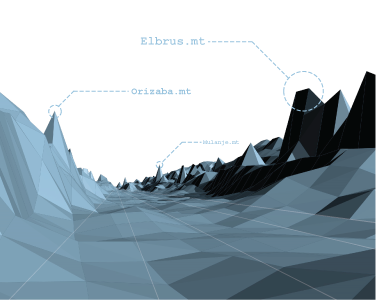 Find the highest elevations in your city. Find the lowest elevation in your city. See how many feet above sea level you live! You can watch National Geographic’s Drain the Oceans Series to see what scientists are discovering on the sea floor. You might also explore Basin and Range Maps which show the height of mountain ranges and the lower depth of plains and basins. Hiking is a great way to understand the slope of the land. On one 11 x 17 inch paper, draw an imaginary topography that has both high points and low points. Be sure to include a north arrow. Draw 1’ contours and label every 5th contour. Lines are everywhere on contour maps! Lines represent elevation changes, political boundaries, railroads, roads and rivers, lakes and canals. Take a look at the United States Geographic System’s Topographic Map Symbols. Make an index of road types, water feature types, territorial boundary types and elevation contours. Be sure to look at the color coding that is used and the thinness or thickness of the lines. Create a topographic map that shows the main roads coming to your neighborhood, any water features, boundaries of blocks and land contours. Looking at the United States Geographic System’s Topographic Map Symbols, find the symbol for glaciers, marshes, sand, gravel, woods, shrubs, orchards and vineyards. 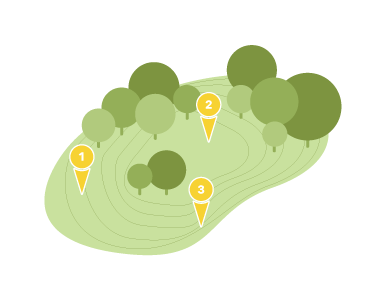 Draw a map of a natural area that has several of these vegetative and water features. There are many online maps that document the contours and topos of the land. Take a look at The National Geographic World Map. Zoom in to find your neighborhood. You can see the streets and buildings and find the contours. 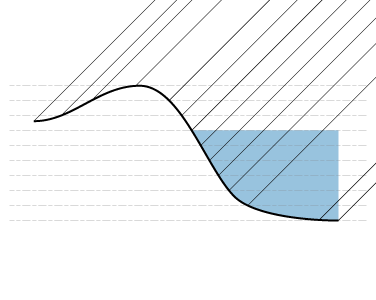 Make a drawing that shows the slope of the land. The slope of the land reveals how the precipitation runs off (or is absorbed) in given location based on land development and land type. You can also check your neighborhood by checking the wikiwatershed or looking at the Watershed Journey to see how topos effect collection of rainwater. When you make your drawing of your block in your neighborhood, show the North Arrow, and outline the houses and use a lighter line weight for the contours. Draw arrows which shows which way the water will drain in your neighborhood. Does it eventually drain into a stream, river, lake or ocean? 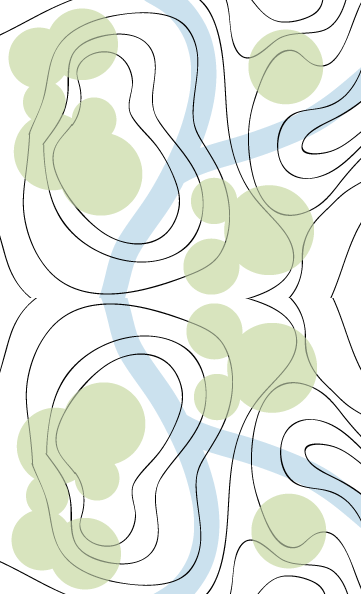 Imagine and plan a topographic garden. As a class project, the teacher can roll out brown paper and divide it into 11 x 17 plots. Students each can pick a plost and start drawing contours. Each student should drawing 20 contours matching the end points with contours that students beside them are drawing. Once students have made their contour maps, they can construct contour models out of 1/16” ply cardboard. 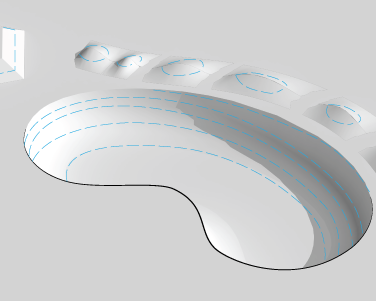 It should have a minimum of 20 (1’) contours. Ten of the contours should build above the 0 level (+1 to +10) and 10 of the contours should build below the 0 level (-1 to -10’). This will give the models a 20’ (or two story variance). The base model should be a 2” x 12” x 17” cardboard ‘box’ with subtractive (–) contours opening down into low laying area(s) in the box and additive (+) contours building hills above the box. Decide where it is high and low allowing for one high flat plane that is app. 4” x 6” and a low flat plane that is at least 2” x 4”. These ‘flat areas’ will be possible building areas and should be marked with dotted pencil on your model. This will affect designs later on as you will respond to the site that you have created. In addition, draw the site showing all contours in plan and in two cross sections at 1’ = 1/16”. After fitting the land models together, students can further develop this model by adding five pavilions based on the pavilion journey that are above the land, on, in, or under the land! As an extra challenge, students can create a skateboard park. As in any design process it is good to begin to look at definitions of skateboard parks, sizes, history, longevity, etc. Factors in Design of SkateBoard Parks is a good starting point. Visiting a local one is also a good place to start. Consider the different sizes of parks and the definition of public place and skate rooms. Skate parks will have different elevations and topographic changes to challenge an array of skateboarding skill levels. Make a model of a skateboard park and share it with your class. Topography refers to the ______ of the land. Geology.com Record High, lows, etc.